Today, I have more Workshop Quilts to share! 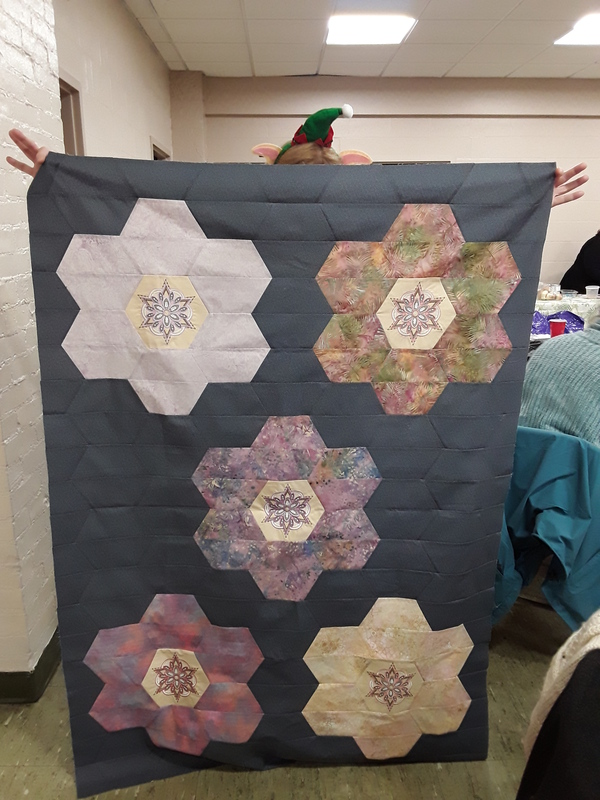 Our guild’s Christmas dinner was last week and several more quilts were shared from the Workshop. I have to say again how thrilled I am to see the work and progress from my students! I love the variety of fabrics and added extras to the Hexie theme. 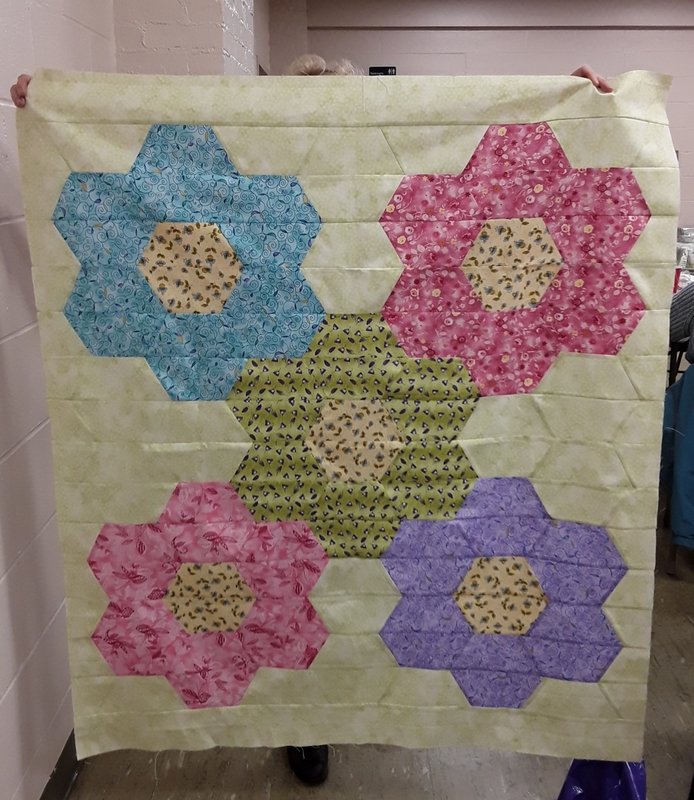 The Flower Garden Quilt was done by Marilyn B. and finished to 42″ x 48″. Very SWEET! This makes a great lap quilt. Carol V.’s Baby Blocks are bold and beautiful. 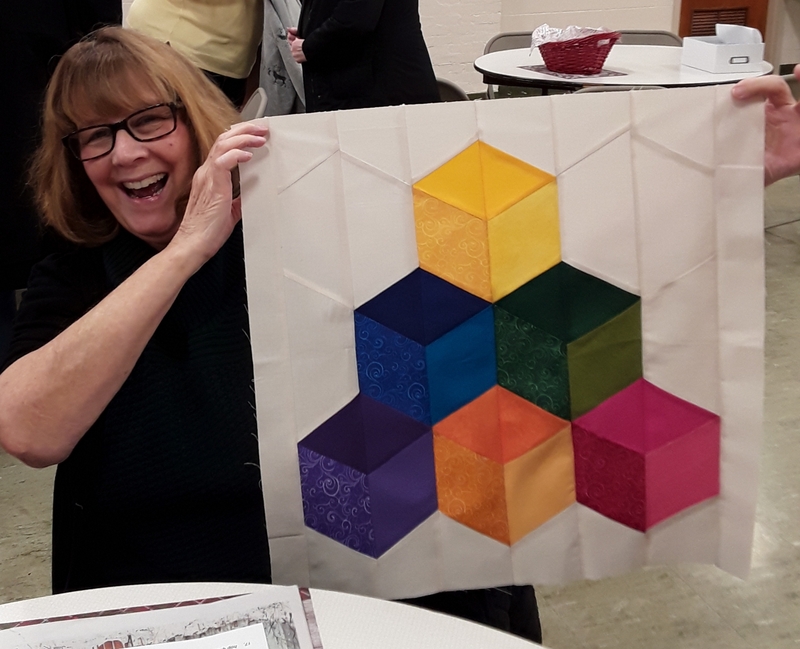 Carol kept to a smaller project so she could learn the basics of a pieced half hexie. Love those colors! AND…WOW! Cheryl G. did a lot of work ahead of class making the embroidery centers of her hexies. Those embroidery snowflake designs were cut into full hexagons for this quilt. Gorgeous! How did Cheryl piece the quilt? She cut some template plastic into the full hexie shape. Centering the snowflake design she traced the full hexie and cut each individually. For the piecing, she did have a set-in “Y” seam to piece the full snowflake hexie in between the other half hexies. All the rest are straight rows across the quilt. Not at all difficult just time to mark the 1/4″ stopping points of the set-in seams. #1 – Including embroidery designs into your pieced projects adds a pop of “wow”! #2 – The full hexie shape was a great spot to add the embroidery. Template plastic was cut to shape to be sure the design was centered in the full hexie. P.S. Happy Holidays to all. May your days be filled with family, friends and laughter. Wishing you peace and joy for Christmas! This entry was posted in Hexagons, Uncategorized. Bookmark the permalink.